Although nothing compares to a real book, smelling of ink and paper, ebooks have some advantages, including extreme portability. However, dedicated e-ink readers like Kindle are still expensive and limited only to reading books and other static content. Using modern gadgets with colour, backlit screen, like iPad doesn't seem a good idea to me (besides they're too damn large). Why not give your old Psion a try? For me, the best application is MobiReader. Not only is the program so well designed, that reading books is a pleasure, but also there are thousands of good books available from MobiPocket and many other sources. You may find dozens of fine, usually free ebooks in MobileRead Wiki. I also recommend Cory Doctorow's books. NOTE: MobiReader for Psion has been released free. In the registration menu type the key: CGHYCXYL. Another ebook reading application worth a look is eBook by Simon Quinn. I use it to comfortably read books in raw text (txt) format. Many of these may be downloaded from Project Gutenberg's website. eBook now is also free, you'll find the registration key on author's homepage. I wanted to write a bit about TomeRaider, which was free to download and a code generator was provided by Yadabyte, but I'm a bit puzzled, because now on Proporta's site it's for $24.80. 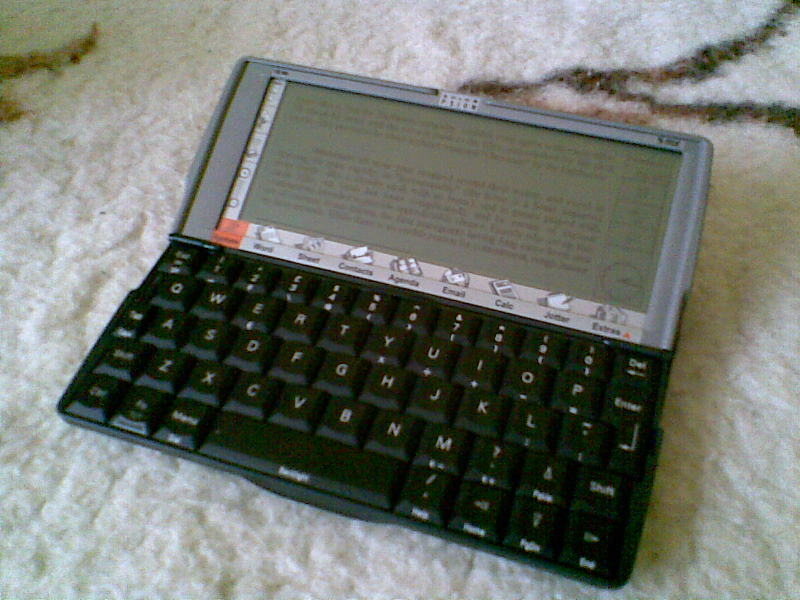 Since there's only an old version (TR2) available for Psion, I think it's not worth its price. The most widespread format for electronic publications is PDF. You can browse PDF documents on Psion, but the effect will be rather unlike reading them on the screen of your PC. Because of Psion's limited processing power, it is really slow. If you're reading mainly texts with no images or equations, the speed will be fair enough to not fall asleep when the page is rendering. But when most of your books are loaded with graphics, reading them may be annoying. I know two programs that handle PDF files, both from mBrain Software. Pdf is released under GNU GPL license. It reads documents up to version 1.3. Pdf has very limited support for embedded objects such as equations. Also, don't expect reading texts with custom national characters (e.g. Polish). Unlike ebook readers described above, it lacks bookmarking, what makes it unsuitable for reading novels. An improved version of Pdf is Pdf+. It's shareware and it supports PDF 1.4 files. There's also a DjVu reader for Psion, but use it only if you really need to view DjVu documents on Psion. It is sloooow, much slower than Pdf, and unregistered version marks the page with reminders. You may download SDjVu from here.